This week we feature a sleek modern stair remodel highlighting one of our best new products, RetroFit tread & riser kits. RetroFit treads and risers are uniquely designed to replace traditionally used carpet and padding. As opposed to purchasing riser and cove materials on their own, this kit provides all materials needed for plain (closed stairs) and mitre return (open ended stairs) in three tread options. 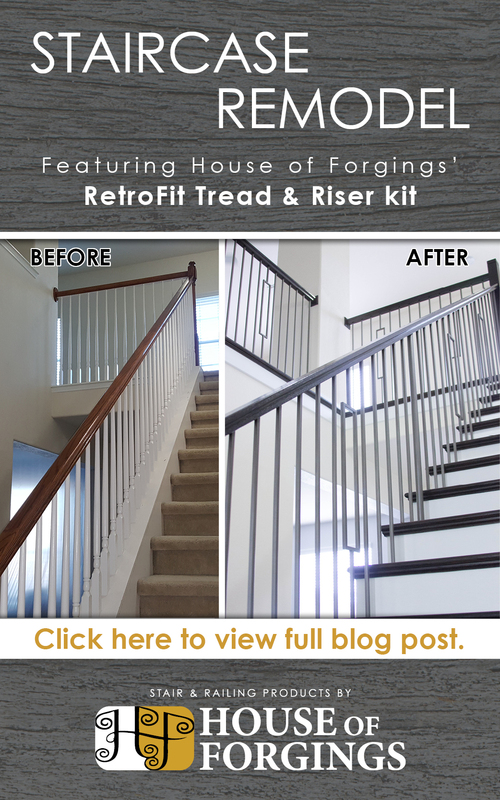 See the below transformation of an outdated carpeted staircase using a full range of iron and wood products from House of Forgings. Call or email us today for more information or pricing.